Q1. What is the famous phrase from the opening credits, and was also the title of the 2nd Star Trek pilot episode (which was also the first episode starring William Shatner)? Q2. What are the most famous Canadian connections on Star Trek? Enjoy the CBS Star Trek original series clip below featuring Leonard Nimoy (Spock) and William Shatner (Captain James T. Kirk). The cult classic and somewhat campy original TV show Star Trek ran from September 8, 1966 to June 3, 1969 on NBC. Perhaps the most popular science fiction television show of all time, the original TV series inspired books, comic books, games, toys, movies, additional/spin-off TV series and fan conventions - all of which continue today, 45 years after the original series went off the air. Numerous phrases, gestures (the two-fingered V for Vulcan, from the character Spock) and philosophies featured on Star Trek have made their way from snippets of pop-culture history to mainstream awareness and usage. A1. ...to boldly go "Where No Man Has Gone Before" was part of the opening voice-over performed by William Shatner. A2. Canadian actors William Shatner (Captain James T. Kirk) and James Doohan (Navigator Pavel Chekhov) were Star Trek series regulars. Star Trek Cast - Where Are They Now? 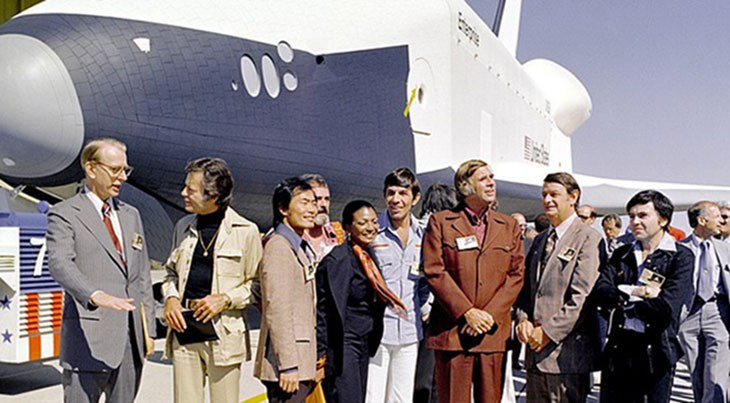 Above from left, Dr. James C. Fletcher (NASA Administrator), DeForest Kelley, George Takei, James Doohan, Nichelle Nichols, Leonard Nimoy, Gene Roddenberry, Congressman Don Fuqua, and Walter Koening. Captain James T. Kirk - His career and personal life have had ups and downs along the way, but octogenarian Canadian-American actor William Shatner, is still performing on stage, TV and in movies. Lieutenant Uhura - Her role on Star Trek was an early career highlight for actress, singer & voice artist Nichelle Nichols. Now in her 80's, she continues to appear on TV and in movies. Lieutenant Leslie - Actor Eddie Paskey's film and TV career pretty much began and ended with his supporting role on Star Trek as a crew member, which may be why he hasn't received much press over the years since then. After Star Trek ended Paskey went into the auto-detailing business, until he sold it and retired in 2004; as a septuagenarian he's the youngest notable surviving cast member. Hikaru Sulu - new octogenarian senior George Takei has continued acting on radio, stage, TV & movies post-Star Trek, and has kept very busy with guest-starring television roles both in person and as a voice artist. Pavel Chekov - Walter Koenig's acting career had just begun when he landed the role of the navigator on Star Trek. The octogenarian senior is currently voicing the role of Mr. Savic on the animated TV series Stretch Armstrong & the Flex Fighters. Gene Roddenberry - Freelance writer, sci-fi fan and Star Trek TV show creator and producer Roddenberry died in October 1991 at 70. Mr. Spock - The pointy-eared Vulcan and long-time friend of co-star William Shatner also enjoyed a long career post Star Trek. Leonard Nimoy passed away in Feb. 2015 at the age of 83. Dr. Leonard "Bones" McCoy - DeForest Kelley had a long career in films before playing the Chief Medical Officer on Star Trek, but after the series found he'd been typecast. He died in June 1999, age 79. Montgomery "Scotty" Scott - Canadian actor James Doohan had compiled a list of guest-starring credits on TV beginning in 1950, before he took on the role of the Star Trek Chief Engineer. James Doohan died in July 2005, age 85. Nurse Christine Chapel - Actress Majel Barrett had begun her film career with a small role in Will Success Spoil Rock Hunter? (1957), 9 years before Star Trek debuted.. When Star Trek ended in 1969, she married the series creator Gene Roddenberry later that same year; they remained married until his death in 1991. She continued acting on TV & in movies, and branched into producing the sci-fi TV series Earth: Final Conflict (1997-199) and Andromeda (2000-2005). Majel Barrett was 76 when she passed away in 2008.